It's our pleasure to announce that Favser has recently partnered with Excel Academy to support MDEC Global Online Workforce’s (GLOW) vision to create a vibrant freelance economy ecosystem in Malaysia. Excel Academy is the authorized partner of Digital Marketing Institute (United Kingdom) offering the Certified Digital Marketing Professional program. This program is the leading Digital Marketing Certification in the world, with over 19,000 graduates in over 115 countries. It's one of the most comprehensive Digital Marketing course available in the market today. The Industry Advisory Council, representing the world’s largest and most influential digital brands, validates all Digital Marketing Institute course content. 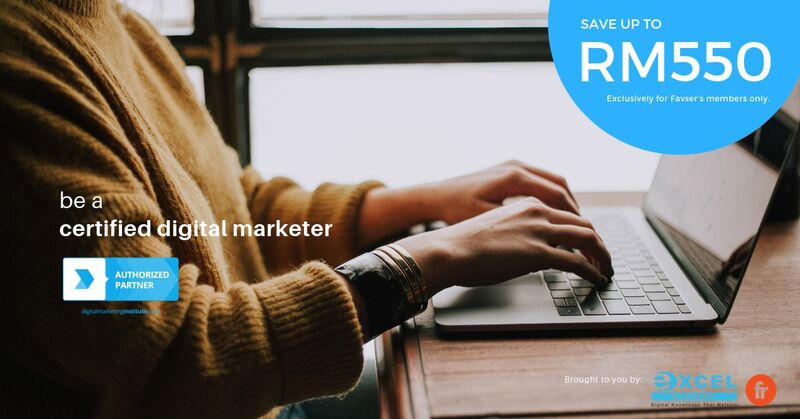 Under the partnership, Favser's members will get access to Excel Academy’s Certified Digital Marketing Professional program at a special discounted rate. As long as you are a member of Favser (both talent and company), you are entitle to this special discounted rate. At the same time, Excel Academy’s students and clients will be able to enjoy special promotion on Favser.com’s credit plans. Key in EXCEL20 to Enjoy 20% on all Favser.com credit plans today!